Only the World’s Finest Compressors come with the Industry’s Strongest Extended Warranty! Other air compressor manufacturers try to match the Royal Blue Warranty by charging extra for a similar plan. 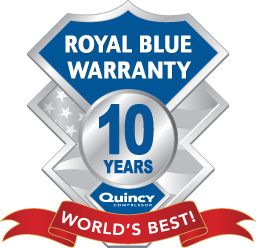 Quincy’s Royal Blue Warranty is available on our popular QSI, QGD and QGV®️ models. There are no extra fees. Simply follow the Royal Blue Policy, as described in the Royal Blue Warranty policy. Buy the compressor, buy the associated extended warranty kit and double the package warranty to two years and the pump warranty to three years. The extended warranty kit includes all that you’ll need for your compressor’s regular maintenance during the next three years. Save 10-15% more than buying items individually AND triple your warranty when you purchase, register and use this kit! Quincy’s extended warranty offers this industry-leading program on all three of its single stage models and its QT PRO/MAX units. Quincy Compressor’s Blue Shield Extended Warranty allows you to extended your current factory warranty an additional 3 or 5 years by using Genuine Quincy parts and fluids specially formulated for use in all compressor applications.The FREE Blue Shield Extended Warranty is available for Quincy rotary screw compressors at least five (5) years old with operating pressures at 150 PSIG and lower. 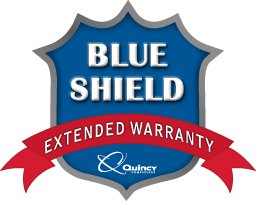 Click here to apply for a Blue Shield Extended Warranty Application. The name speaks for itself! 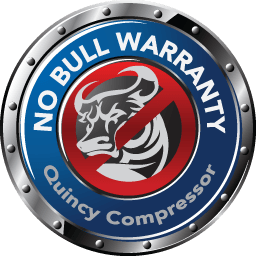 Quincy Compressor’s 10-Year Heat Exchanger Warranty is FREE and covers the heat exchanger for 10 years on all Quincy cycling, non-cycling and high temperature Refrigerated Air Dryers.